Increased safety of the slurry reservoirs, stabilization of the slurry volume by decreasing its water content. 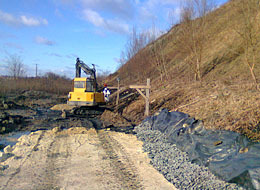 The slurry reservoir catastrophes of the last years (cyanide contamination of the Tisza, the “red mud catastrophe”) attracted the attention to the storage problems of very fine industrial slurries transported by hydro-mechanisms and stored in form of suspensions. Structural or geotechnical anomalies in the dam structures of the slurry reservoirs, or in the subsoil layers under these dam structures, in rainy periods, can lead to dam failures (thus, weak points of the dam structure cannot support any more the slurry volume, and a catastrophe of mud flooding occurs). 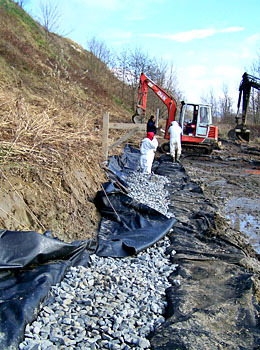 By decreasing the water content of the slurry volume stored in slurry reservoirs (which can be considered as free flowing, saturated soil with very fine grains and uniform granulometry), the slurry pressure on dams can be significantly decreased, and as a consequence, safety level will considerably increase. To dry slurry volumes with walkable surface, but still free flowing and saturated in depth, the drilled drainage system with vertical gravel bodies, developed by Sycons Kft., can be efficiently applied. In the case of the slurry reservoir of Gyöngyösoroszi, this process was successfully applied to dewater the stored slurry mass. 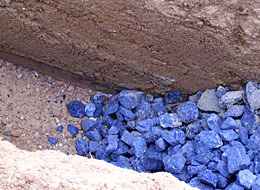 Of course, in these cases, the water collected by the drilled drainage system with vertical gravel bodies, installed in the slurry volume, can be harmful to the environment, thus, these waters require appropriate disposal.